Feline Natural Chicken and Grass-Fed Venison Feast is a premium canned cat food that provides over 80% moisture in each can which supports hydration. 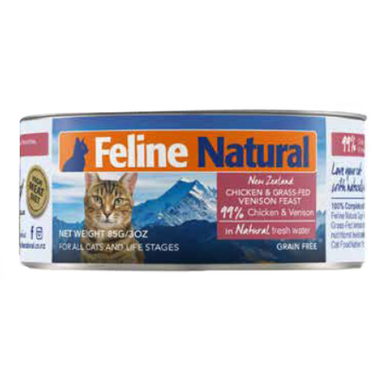 Feline Natural cans are the perfect balanced diet or ideal nutrient rich high meat boost to add to your cats existing diet. Cats fed dry food diets take in just half the moisture of a cat eating canned food. No meat by products, artificial preservatives, colours or flavours. Ingredients: Chicken, Venison Heart, Venison Kidney, Venison Liver, Venison Blood, Flaxseed Flakes, New Zealand Green Lipped Mussel, Dried Kelp, Vitamin E Supplement, Zinc Proteinate, Canola Oil, Manganese Proteinate, Thiamine Mononitrate, Vitamin D3 Supplement, Folic Acid. Water added for processing. This is a high quality food, but even so, my cats aren't overly thrilled with it. Two of my four kitties will eat it, but not with too much gusto. And they rarely eat the entire portion, they always leave some in the bowl no matter how large or small the portion they receive. Since they refuse to eat leftovers there is some wastage, and considering the high cost of this food, the wastage is not appreciated by this cat mom! Seems to be great quality food, so I had high expectations, but neither of my cats will touch it.